City officials Wednesday unveiled $1.7 million in improvements to Larsen Athletic Field in San Ysidro. The park received new play equipment, drought-tolerant landscaping, picnic tables and benches and additional parking, according to the mayor’s office. Paths were upgraded to meet Americans with Disabilities Act standards. The work was partially funded by a $1 million federal grant awarded by the U.S. Department of Housing and Urban Development, and came two years after the city made major improvements to lighting at the park. 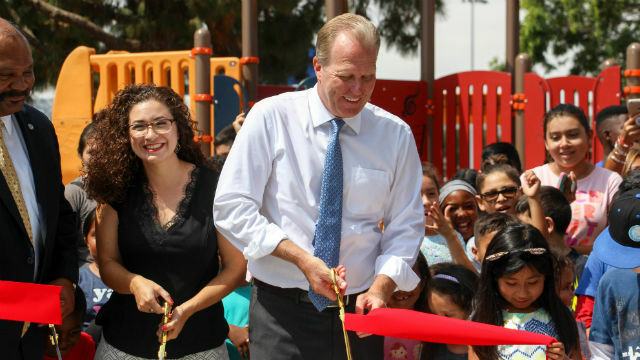 “When we invest in our parks, we breathe new life into our communities,” Mayor Kevin Faulconer said at a ribbon-cutting ceremony.